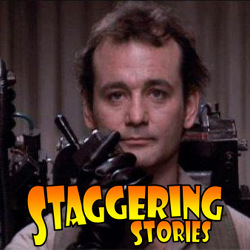 Staggering Stories Podcast #242: Who You Gonna Call? 02:14 — Star Trek: Makes a Discovery. 05:21 — Star Wars: Thrawn Recanonised. 08:06 — Doctor Who: Buy a Dalek in a televised auction. 09:53 — William Lucas: DEAD! 10:55 — John Barrowman: A cosplay overload and threats. 14:46 — Star Trek: New RPG on the way. 16:32 – Doctor Who: The Monster of Peladon. 30:33 – Game: Things in Five Words. 36:11 – Ghostbusters: Answer the Call (aka Ghostbusters 2016). 69:30 – Farewell for this podcast! Modipius: Star Trek Adventures RPG. Wikipedia: Doctor Who – The Monster of Peladon. BBC: Doctor Who – The Monster of Peladon. 02:45 — BBC Three: DEAD! 04:48 — Doctor Who: Radiophonic Workshop celebration event. 05:51 — James Ellis: DEAD! 07:14 — Gillan Watch: Oculus trailer released. 08:23 — Simon Fisher-Becker: One man show My Dalek has a Puncture. 09:40 — Peter Capaldi: Paddington Bear film coming in November. 11:16 — IDW Comics: Now has the licence to ‘Inspector Spacetime’. 12:57 – 30 Second Recommendation: Redshirts novel. 15:05 – Doctor Who Trivial Game and Paranoid Pursuit. 49:48 – The Third Surrey Steampunk Convivial. 74:27 – Farewell for this podcast! Radiophonic Workshop: In conversation and concert. Simon Fisher-Becker: My Dalek has a Puncture. The Third Surrey Steampunk Convivial.